Disney animation has been an epic turnaround over the last couple of years. So much so, that I am anticipating regular Disney animation films every year compared to Pixar films. That is a statement I can't believe I just typed. But alas, it is true in my eyes. They are slowly returning to the place where they started, and showing us why they were the most dominant studio in animated entertainment. "Zootopia" is one of the very best movies Disney has ever made. Yes, its amazing from beginning to end. Not because of the animation, which is absolutely breath-taking by the way. Not because it follows a similar pattern of the same Disney template. The lead character wants to be something very badly, and they will display lots of courage and never give up. They will make an unlikely friendship in order to achieve a goal. Even though there are some curve-balls, the character is successful and it goes to show that no matter who or what you are, you can achieve your goals. That has been Disney's memo virtually from the get-go. While this message is loud and clear in "Zootopia," it approaches the message in a much different format than ever before. The film also illuminates something I never would have thought would appear in a Disney movie before. The main character in "Zootopia" is Judy Hopps (Ginnifer Goodwin) a rabbit who lives in a world where all animals, predator and prey live together in harmony. The seemingly birthplace of this harmony is Zootopia, a massive and vibrant city. Judy wants to go to Zootopia in hopes of becoming the first rabbit police officer. She learned from a very young age to never back down and to always hold her ground. She is a tough one and she wants to prove it on the police force. She makes it through the academy, but her Zootopian chief Bogo (Idris Elba) has little faith in her, and only gives her oddjobs to do. When she catches wind of a kidnapping, she is given the job to investigate. She also has a the help of a petty Fox (Jason Bateman) for help. The mystery that unfolds in the movie feels very much like a classic L.A. mystery, and on that level I very much enjoyed the movie. Over the backdrop of seamless animation, filled with several clever jokes about the animal kingdom sprinkled throughout the movie. I particularly loved the idea that Zootopia's districts are all different living habitats for animals. But what really got me with "Zootopia" is what the movie was trying to say. "Zootopia" is a movie full of surprises. It tells us to challenge the zeitgeist. It puts what is happening in our country and our culture right now and sticks it under a microscope. "Zootopia" is a comment on the social landscape that we live in right now, and that is what surprised me the most. I would have never thought that a Disney animated film would tackle such ideas as racial profiling, governmental foul-play, living in a state of fear due to the media and how we are adjust into the roles we are given since birth. These are big ideas, ideas we never find in kids movies, yet they are so fully realized and so profoundly addressed in "Zootopia" that I couldn't believe what I was seeing, and I doubt you will too. 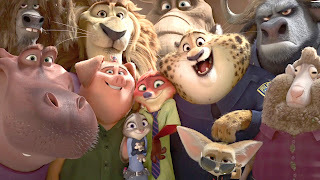 It amazes me that years from now, when the next generation tries to make sense of the Black Lives Matter movement, and the various killings, and police brutality and the feelings not fully leaving the past behind us, I think it will shock people that an animated Disney film like "Zootopia" tackled these ideas head-on. Disney usually isn't an in-the-moment type of studio, but I applaud the studio for taking a huge dive into the new and different and creating something that is accessible to all ages, but has something true on its mind. Its also a movie that is at times, funny and charming as the very best of the Disney catalog. "Zootopia" is a movie that plays by the normal Disney rules, but also tears them down. This is a surprising shift in tone for the studio and I am curious to see if they continue to make movies in this type of vein. This doesn't have to be another fluffy animated movie from Disney that you take your kids to and just zone out after a long week at the office. This is a vibrant movie, full of energy and ideas for you to take with you. It is truly amazing and not what I expected. March Madness- Heroes Vs. Villains The Sequel! The Second "Captain America: Civil War" trailer!